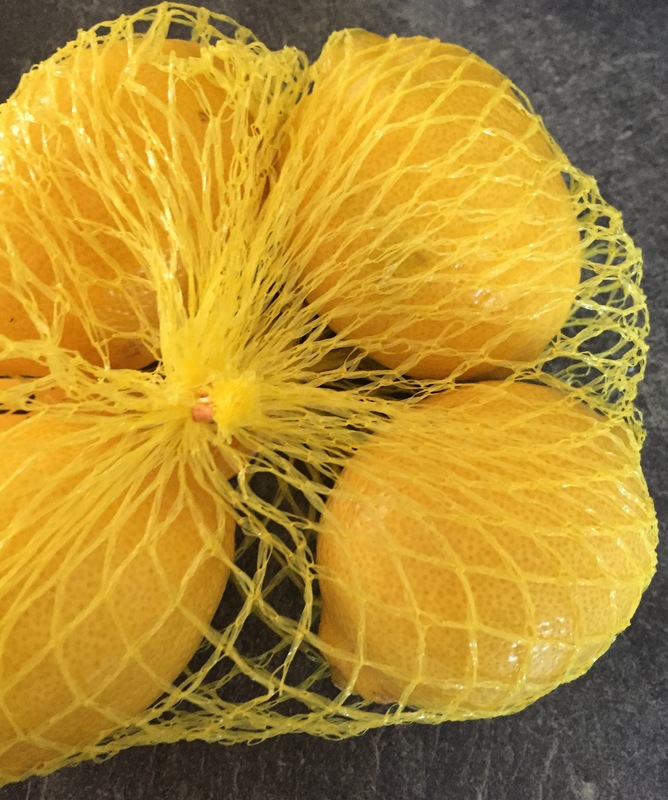 This isn’t just lemon curd. 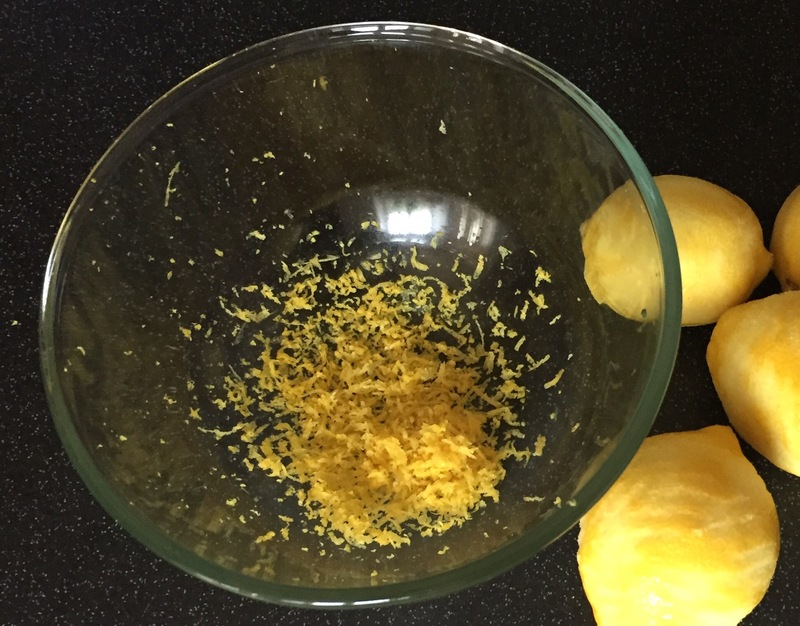 This isn’t even our lemon curd – it’s Nigel Slater’s Lemon Curd. This post is a bit of a departure from our usual style. Whilst we have a couple of recipes waiting in the wings, we have to be honest and admit that when it comes to the classics, we do like to turn to the tried and tested recipes penned by those old enough to know better from time to time. Whilst I would normally skip over these episodes of unworthy of original blog content, Charles suggested that some of the classics by the biggest names in UK cookery were actually worth of review and I think he might be onto something. Lemon curd seemed like a good place to start. It’s something we’ve both made a number of times, and it in fact featured in a poem which was read at our wedding. 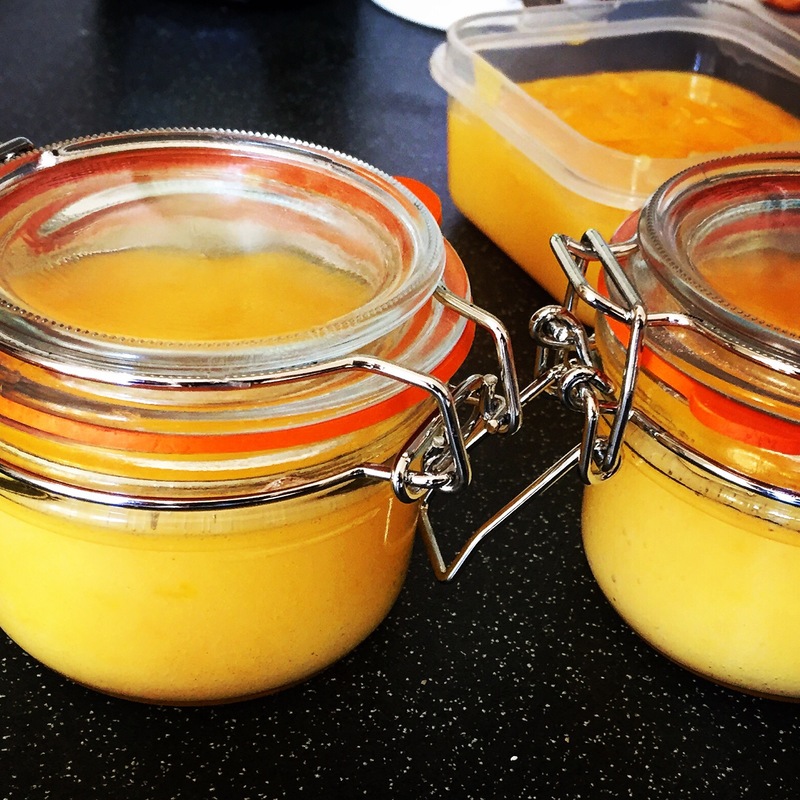 We’ve both tried various recipes, including Delia’s, but I was intrigued when I read Nigel Slater’s lemon curd recipe given he uses a whisk to get it all mixed up – a bit of a departure from the usual wooden spoon or silicone spatula and decided that this was worthy of comment! To make it, I found it easiest to get all the ingredients ready first, starting with finding a Pyrex bowl and small saucepan which would allow the bowl to balance comfortably with space below it for some simmering water, then adding a few inches of water to the saucepan and putting it on a medium heat hob. Next, zest the lemons into the Pyrex bowl and then juice them and add the juice to the bowl, removing any pips. I find this to be the most time-consuming part and it’s unavoidable, but Nigel rather glosses over the time you need for this stage by stating that they should be zested and juiced in his ingredients list. 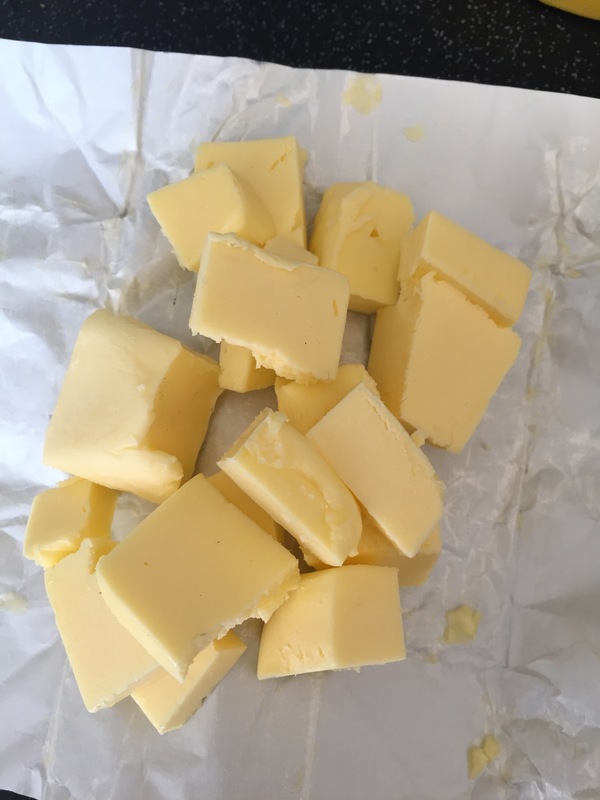 Stir in the sugar, and cut the butter into cubes. Place over the simmering water (try not to be tempted to use a very hot hob as boiling the water will tempt the water to overboil and potentially jump into the curd, or boil dry, or cook the curd so hot that it scrambles, which is the elephant in the room in terms of curd failure or success. 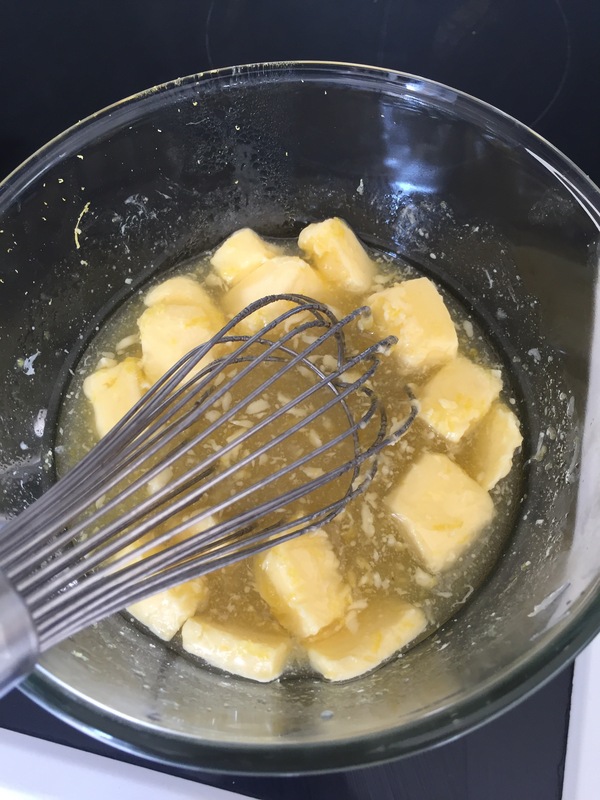 Stir until the sugar has dissolved then add the cubes of butter. 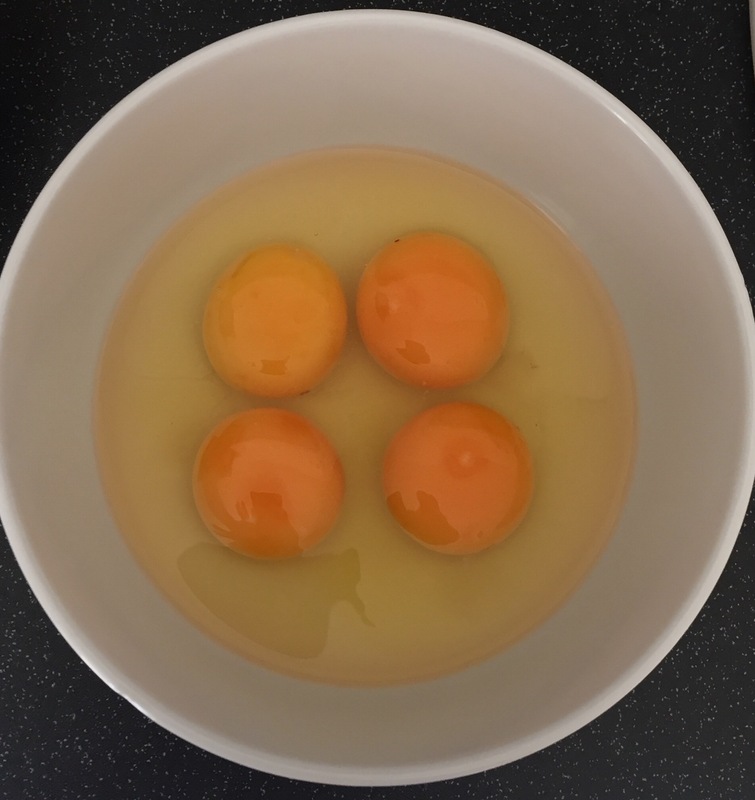 Meanwhile, crack 3 of the eggs into a bowl and separate the fourth, adding only its yolk to the bowl. Whisk together with a fork. 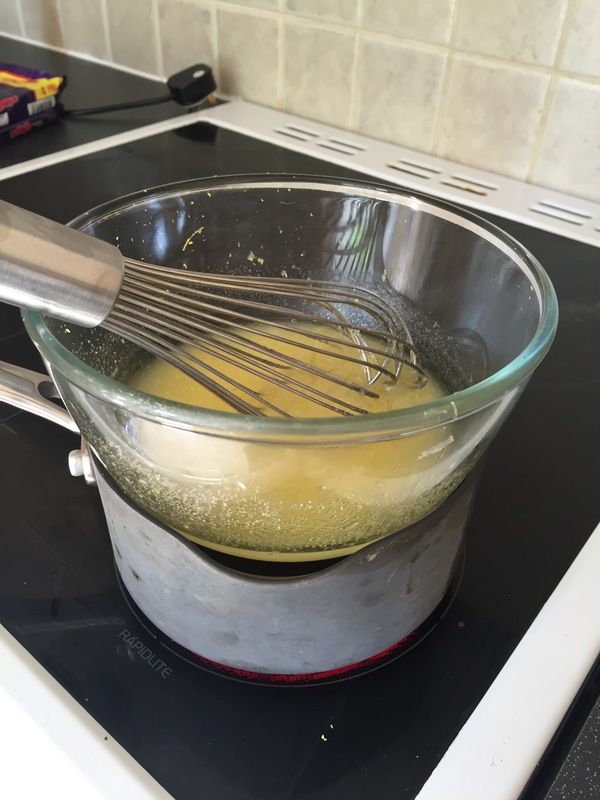 Stir the lemon, sugar and butter mixture until the butter has all melted. Now, Nige doesn’t mention it, but you should really consider the temperature of the bowl and mixture st this stage because you’re about to add the eggs. 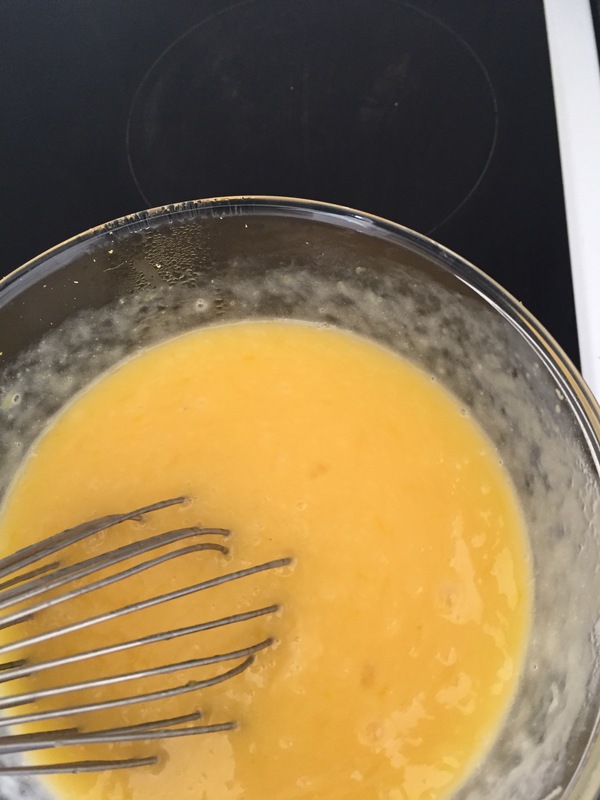 If you’ve ever made custard, you’ll be familiar with the danger of scrambling the eggs if you add the cream or milk when it’s too hot. 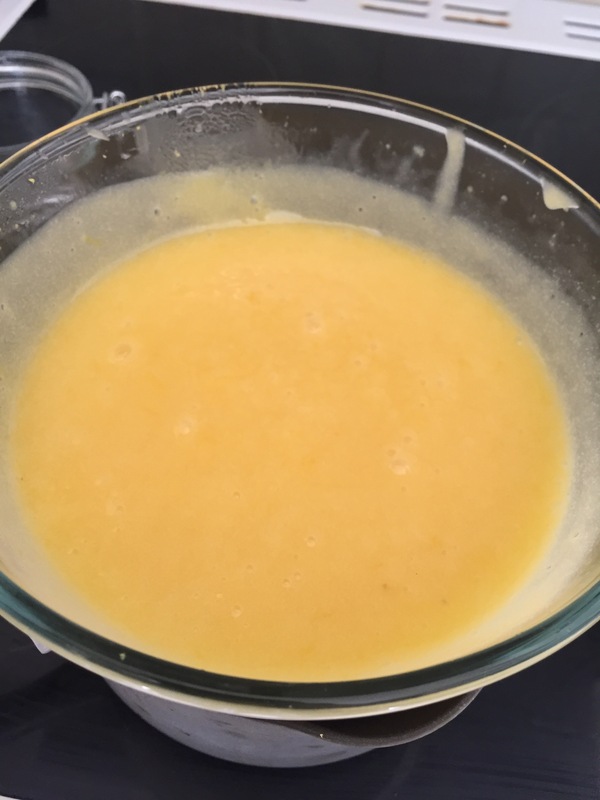 Likewise, with lemon curd, it’s worth taking a few extra minutes to cool the melted mixture (even though you are going to have to heat it again) to be sure you aren’t going to scramble the eggs and waste all the time you didn’t zesting and juicing all those lemons. The simplest way is just to take it off the heat and give it a stir for a minute or two. 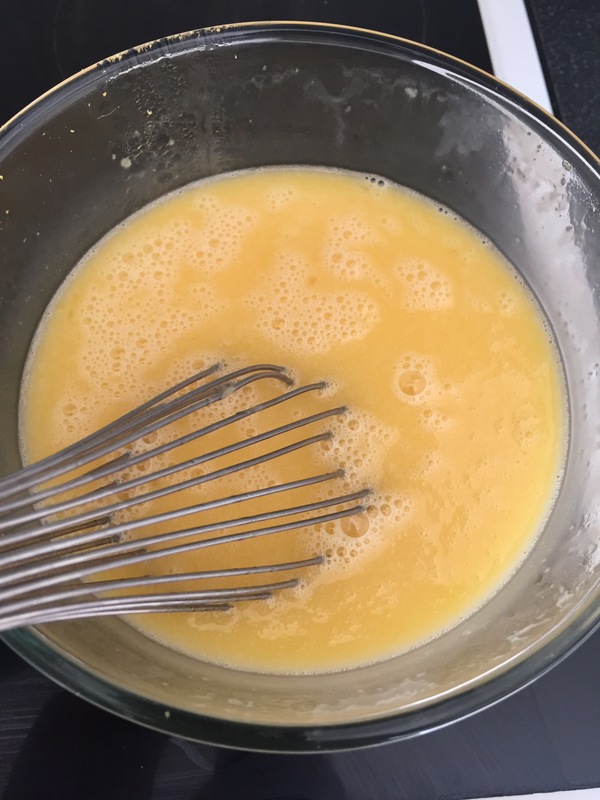 Next, pour in the eggs, being ready with your whisk to stir it all together to even out the temperature of the two bowls before there are any disasters. This takes a bit of muscle, but it does mean the curd is immediately much thicker than it would be by any other method. Now, get whisking! 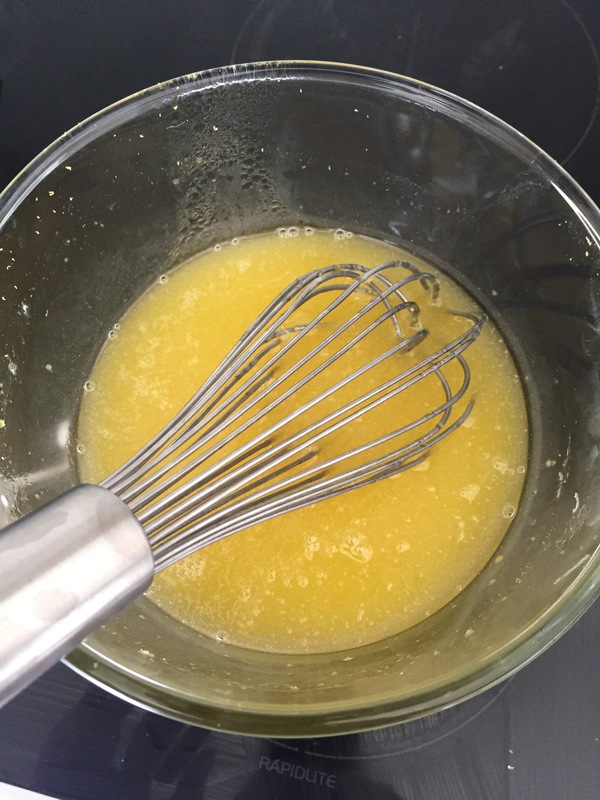 I used the whisk to sort of stir it around most of the time, whisking it up properly as it thickened, as it’s actually pretty difficult to whisk a hot liquid in a steaming bowl which moves around all the time! When it’s well on its way to being done, the texture will become more consistent and small frothy bubbles will start to form on the surface. If it’s taking too long , you may be tempted to turn the heat up, and you can do, just be careful of monitoring it and consider turning it back down if the water underneath the bowl is boiling too hard – the point at which your curd is ready versus when it can turn bad is pretty precise so a more controlled temperature is a more cautious approach. It’s really important too that you stir constantly, even if it does take 10 or 15 minutes to get to the correct consistency. Your curd will be worth it! Checking it’s ready was pretty difficult with the whisk. Nigel says it should “feel heavy on the whisk” but Charles’ whisk is pretty heavy anyway so my wrist was too tired to tell the difference. 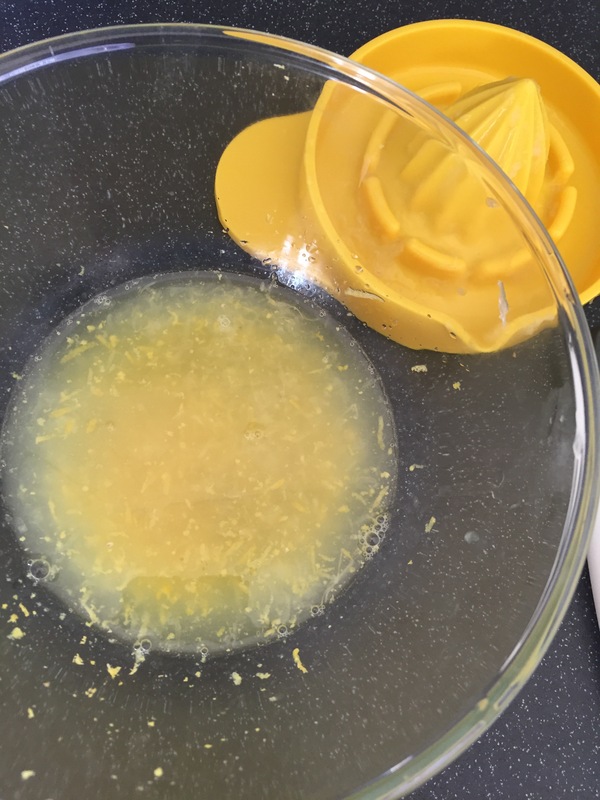 As I had experience of making lemon curd, however, I could tell that the thick custardy texture was nearly ready so I grabbed a silicone spatula to dunk into the mixture. The curd coated it, and the costing remained separated after I ran my finger through it, so it was ready to be poured into sterilised jars to set and later refrigerate. 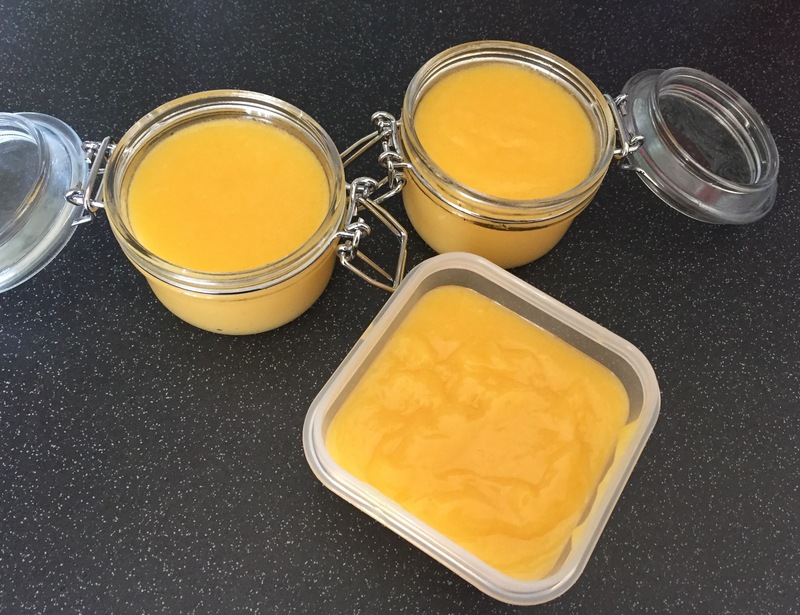 Overall, the result was a decently balanced fresh lemon curd, thick, zesty and tart, but sweet and creamy enough to make it as moreish as fresh lemon curd tends to be. Whilst it was a little odd getting used to the whisk, and required more concentration that the endless stirring I’ve encountered in the past, it made for a much, much quicker way of producing three small jars of curd. And that makes it a winner in my book!